The mass deaths of refugees in the Mediterranean Sea has reached a new, grim record over the first five months of 2016. According to the UN’s refugee agency (UNHCR), at least 2,510 refugees drowned between January and May during their attempts to cross to Europe. The European governments and European Union bear full responsibility for turning the Mediterranean into a mass graveyard for refugees. By questioning the survivors of recent accidents, the UNHCR estimated the number of victims. According to this, 880 refugees lost their lives in the Mediterranean in the last week of May alone. The International Organisation for Migration (IOM) even suggests there could have been more than a thousand drowned refugees. Previous estimates put the number at 700 victims from three capsized boats, but refugees reported many more were confined in the holds of the boats. In addition, 47 refugees are missing after a lifeboat with at least 125 on board deflated and capsized. “For so many deaths to have occurred just in a matter of days and months is shocking and shows just how truly perilous these journeys are,” said UN High Commissioner for Refugees Filippo Grandi. Compared to the same period last year, when 1,855 refugees lost their lives in the Mediterranean, the number of deaths has increased by 35 percent. According to UNHCR figures, 203,981 refugees have been registered after successfully surviving the crossing to Europe to seek protection there. Of these, 46,714 came to Italy, about the same number as last year. Particularly in the months January to March, the overwhelming majority came via Turkey through Greece. In the process, 376 people drowned. But since the so-called Balkan route has been closed by means of the dirty deal between the EU and Turkey to ruthlessly deport refugees, the numbers of deaths on the much longer and riskier route from Libya to Italy has risen dramatically. “The North Africa-Italy route is dramatically more dangerous: 2,119 of the deaths reported so far this year are among people making this journey, making for odds of dying as high as one in 23,” explained UNHCR spokesman William Spindler. In other words, out of every 100 refugees starting their journey in Africa, four die in the attempt. The Mediterranean, directly adjacent to the rich countries of Europe and a popular tourist destination, is thus by far the most dangerous sea route for refugees in the world. According to official estimates, at least 30,000 refugees have drowned there in the last fifteen years. The EU has responded with indifference to the rapidly rising number of victims. When the refugee assistance organisation SeaWatch, which supports rescue efforts in the Mediterranean, recently published a picture of a volunteer holding a dead baby in his arms, it provoked no outrage about the European governments’ inhumane policy of sealing off Europe’s borders. When in September 2015 the picture of the drowned Syrian boy Aylan Kurdi lying on a Turkish beach was prominent in the media, empty promises and hypocritical phrases of sympathy were heard from Berlin and Brussels. However, the latest refugee tragedies in the Mediterranean have been virtually ignored. “The mass deaths of refugees on Europe’s borders are being accepted as collateral damage,” wrote Spiegel Online. The deaths in the Mediterranean are part of the logic of the EU’s refugee policy, calculated to act as a deterrent. When, on October 3, 2013, 366 refugees horrifically drowned off the coast of the Italian island of Lampedusa, then Italian Prime Minister Enrico Letta launched Operation Mare Nostrum. Originally intended as a mechanism to force boats back to the Libyan coast, it was unwillingly transformed into a sea rescue mission, since the rescue of people from shipwrecks is a central tenet of international law. Almost 150,000 refugees were thus saved from drowning. But the rescue of refugees was an irritant for the EU, and above all for the German government. With the absurd argument that Mare Nostrum was encouraging more refugees to set off for Europe, German interior minister Thomas de Maiziere called a halt to it. 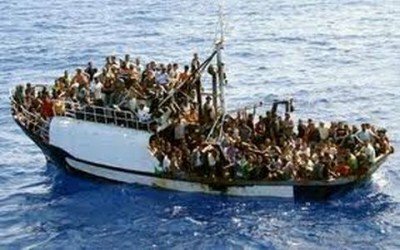 Instead, on November 1, 2014 the EU adopted the much smaller Operation Triton, which was concentrated on a limited coastal area of sea, and led to the resumption of the mass deaths in the Mediterranean. In early 2015 almost 1,500 refugees died within a few weeks, as the EU and its border protection agency Frontex looked on. “It is not enough to cry in front of the television in the evening when refugees are drowning in the Mediterranean, and hold a moment of silence in council the next morning,” EU Commission President Jean-Claude Juncker said at the time. The EU’s response consisted in the militarisation of the Mediterranean. Since then, two dozen warships from the European states have been patrolling the Mediterranean between Libya and Italy as part of Eunavfor Med (European Naval Force—Mediterranean) Sophia. But their goal is not the rescuing of shipwrecked passengers, but rather the combatting of smugglers, whose boats are to be captured and destroyed. The mission has just been extended for a further year and is to be stepped up along the Libyan coast. In order to obtain a mandate from the UN, the Libyan puppet government of Fayez al-Sarraj imposed by the US and European powers has requested support in building up the coastguard and the combatting of the arms trade. In truth, the al-Sarraj government has no power in the North African country, and is merely in place to follow the orders of the western powers and sign off on a new NATO intervention. Since the NATO war of 2011 to topple the Gaddafi government, Libya has been destroyed and is engaged in a bloody civil war. Hundreds of thousands of people were either slaughtered or driven from their homes. The countless refugees from African countries to the south were treated arbitrarily and are now confined to internment camps, where they have been tortured and abused. Despite this, the EU is pushing for close cooperation with Libya to prevent refugees from travelling to Europe. “Now the task before us is to agree such a cooperation with Libya,” said German Chancellor Angela Merkel in March, following the conclusion of the deportation agreement with Turkey. The European Union has no qualms about working together with despotic regimes in Africa. The Eritrean government, which tramples human rights underfoot, received €200 million from the EU to detain refugees. Sudanese President Omar al-Bashir, who has been charged by the International Criminal Court in The Hague with genocide and crimes against humanity, has received technical equipment for border surveillance from the EU. In addition, the EU is supporting the construction of refugee camps in Sudan. The regimes in Egypt and Morocco are also being provided by European arms concerns with border surveillance and military equipment. The goal of the EU’s policy is to prevent refugees from reaching the Mediterranean coastline at any price and to detain refugees in far off camps in Africa and Asia. More than 14 million refugees are already confined to camps in Jordan, Turkey, Pakistan, Kenya, Tanzania, Ethiopia and Lebanon. They are victims twice over of the criminal policies of the imperialist powers. The top ten list of countries with the highest number of refugees is practically identical with a list of the countries that have been the victim of a military intervention, proxy war or orchestrated regime change operation which have been initiated over the last twenty years by the US and its European allies. The list includes Syria, Afghanistan, Somalia, Sudan, South Sudan, the Democratic Republic of Congo, Central African Republic and Iraq. More than 60 million people around the world are refugees, and half of these are under 18. In Africa, an additional factor driving hundreds of thousands to flee is the brutal neocolonial policy of the EU, which ruthlessly exploits the continent’s natural resources and completely destroys the standard of living of the populations by structural adjustment programmes and dictated trade regulations. These people place all their hopes in finding work in Europe. But Europe hermetically seals itself off from the wave of refugees it has itself produced, and allows them to drown miserably in the Mediterranean, vegetate in huge refugee camps under outrageous conditions, and be shot on the Turkish-Syrian border, where the Turkish government has allegedly established automatic firing posts. As the Frankfurter Allgemeine Zeitungreported, “intelligent” surveillance towers are involved, with heat-sensing cameras and machine guns, in the regions of Hatay, Gaziantep, Sanliurfa and Marden.